Flammang's Patent Revolving Back Camera (front focusing pattern) is nearly identical to the St. Louis Reversible Back Camera but was introduced one year later. 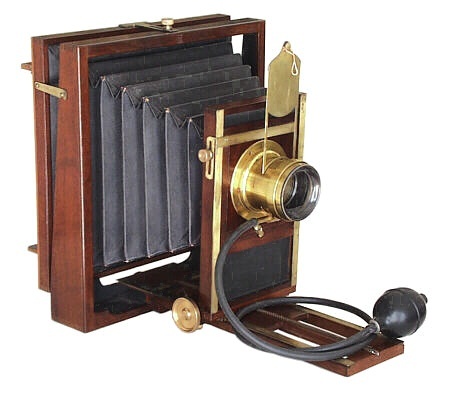 This particular camera is a whole-plate example equipped with Flammang's distinctive rotating ground-glass assembly, mahogany body, cherry base, brass trim, black fabric bellows, and Morrison D lens. The camera dates to the early production years because it lacks the 1885 patent Flammang sliding bed locks. A long brass screw running from the rear standard to the rail hinge serves to lock the bed rails. The front standard also exhibits an early design variation, having a square rise/fall lensboard assembly that is mounted over a front standard with a matte-black finished interior. This differs from the traditional St. Louis style front standard which has a large rectangular assembly mounted on a front standard with a polished interior wood finish. This camera is an especially nice find because it includes a rare, inter-lens drop-shutter mounted inside of a Morrison D lens. Flammang's Patent Revolving Back Camera (front pattern) was made in standard formats from 4 x 5 inches to 20 x 24 inches. The camera is much smaller than an equivalent format rear focusing model which would make it easier to carry in the field. The single swing model shown here sold for $40 in 1892. This was an expensive camera at the equivalent of $758 in year 2000 dollars. Addition of an inter-lens drop-shutter was achieved by carefully cutting slots into the lens barrel and mounting a pneumatic release underneath. The shutter release mechanism is an ingeniously simple design consisting of a finely machined mount and an air powered piston with a curved brass rod. The precision workmanship of the assembly suggests that the shutter may have been added by the original manufacturer. 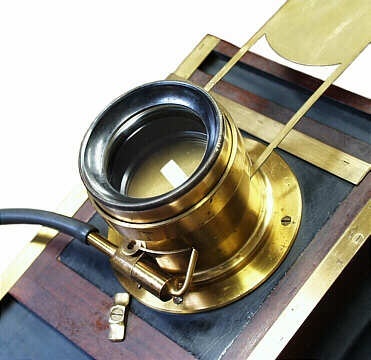 With the piston in the closed position, the brass rod nestles into a small notch cut into the brass guillotine blade, preventing it from dropping. Squeezing an air-bulb forces the piston and brass rod outward from the lens, allowing the blade to drop through the barrel. A collar added to the top of the blade prevents it from falling completely through the lens. A second notch located midway up the guillotine blade allows the shutter to be held in an "open" position for composing an image on the ground glass. As a note, this camera came with an original American Optical Company marked polished wood lensboard and a duplicate ebonized lensboard. The shutter detail image shows the Morrison D lens mounted on the ebonized lensboard. Instantaneous shutters first appeared in the 1850s, the earliest of which were drop, or guillotine shutters. The shutter is simply a vertical plate held by a frame inside the lens barrel. Most drop-shutters operated by gravity while others incorporated rubberbands for faster speeds. The vast majority of drop shutters were mounted on the front of the lens and had a tendency to fall off when in use. Drop-shutters were mostly seen in the 1880s but rarely found today. They were quickly replaced because the drop-blade was prone to vibrating.